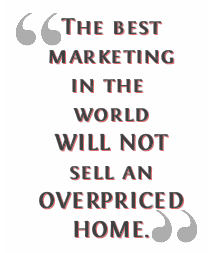 Selling your home - especially if you&apos;ve never done it before - can be emotionally challenging. Strangers will come into your home and poke around in your closets and cabinets. They will criticize a place that has become more than just four walls and a roof to you, it&apos;s a place where memories have been made. With no experience and a complex, emotional transaction on your hands, it&apos;s easy for home sellers to make lots of mistakes, but with a little know-how, many of these pitfalls can be avoided altogether. Read on to find out how you can get the highest possible price for your home within a reasonable time frame - without losing your mind. Sellers who do not clean and stage their homes are throwing money down the drain. If you can&apos;t afford to hire a professional, that&apos;s OK - there are many things you can do on your own. Failing to do these things will not only reduce your sale price, but may also prevent you from getting a sale at all. For example, if you haven&apos;t attended to minor issues like a broken doorknob, a potential buyer may wonder whether the house has larger, pricier issues that haven&apos;t been addressed. Take care of small items you&apos;ve been putting off, like fixing sticky drawer pulls or a leaky faucet. A good agent will point out areas of your home that need work - because of your familiarity with the home, you may have become immune to its trouble spots. Decluttering, cleaning thoroughly, putting a fresh coat of paint on the walls and getting rid of any odors will also help you make a good impression on buyers. With a particularly contentious political season in full swing, you should get rid of any kind of party affiliation or presidential endorsement. The last thing you want to do is bring politics into a home sale, or have that topic come up at closing. Do a political purge, and put any party signage in storage. We understand hunting is a hobby, and we’re not here to judge you. But multiple animal heads on the wall and an upright stuffed badger chillin’ in the parlor can give an otherwise great-looking room a creepy or foreboding vibe. For buyers, a new home often means the start of a new life, or an infusion of new possibilities. Dead animals, well, they can impose a feeling of dread that can linger throughout the entire showing (and perhaps long after). And those buyers who straight-up hate hunters may make a snap judgment not to deal with you. So even if you stuffed the beloved family pet, just keep it out of sight. Keeping in line with removing the animal heads off the wall, make sure there is nothing stopping buyers from falling in love with your home during showings. Clean and remove clutter and get rid of personal items such as family photos along the stairway and your kids’ artwork on the fridge. If your home is currently empty or near-empty, or your furnishings aren’t to most buyers’ tastes, it will be difficult for potential buyers to picture themselves living there. If someone wants to view your house, you need to accommodate this person, even if it is inconvenient for you. And yes, you have to clean and declutter the house before every single visit. A buyer won&apos;t know and won&apos;t care if your house was clean last week if it isn&apos;t clean when he or she views it. It&apos;s a lot of work, but stay focused on the prize. Setting the right asking price is key. Remember the comparable market analysis you did when you bought a home to figure out a fair offering price? Buyers will do this for your home, too, so as a seller you should be one step ahead of the game. Overpriced homes do not sell. Don&apos;t worry too much about setting a price that&apos;s on the low side because, in theory, this will generate multiple offers and bid the price up to the home&apos;s true market value. In fact, under pricing your home a bit can actually be a strategy to generate extra interest in your listing. If you do all of these things when selling your home, you can avoid the costly mistakes listed here, it will go a long way toward helping you put your best foot forward and achieving that seamless, lucrative sale every home seller hopes for. For more information on the home selling process or to provide you with a Market Analysis of your property, give us a call at (760) 586-0854.